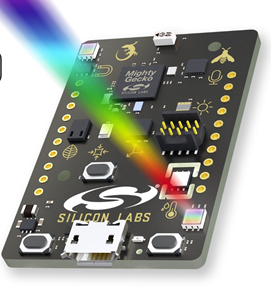 Silicon Labs has released Thunderboard Sense, a sensor-to-cloud development kit based on the EFR32 Mighty Gecko multiprotocol wireless system on chip (SoC) with a 2.4 GHz antenna that supports Bluetooth Low Energy (BLE), ZigBee, Thread, and proprietary protocols. The 30 mm x 45 mm Thunderboard Sense includes relative humidity and temperature and UV index and ambient light sensors from Silicon Labs (The Si7021 and Si1133, respectively), a Bosch Sensortec BMP280 barometric pressure sensor, Cambridge CCS811 indoor air quality gas sensors, Invensense ICM-20648 6-axis inertial sensor, and Knowles SPV1840 MEMS microphone. Inputs from these sensors can be transmitted to the cloud and displayed in real-time in a ready-to-use Android/iOS mobile app, enabling developers with limited networking experience to build connected applications quickly. The onboard EFR32 Mighty Gecko SoC onboard the Thunderboard Sense is powered by an ARM Cortex-M4 processor core, and a companion EFM8 Sleepy Bee microcontroller (MCU) from Silicon Labs allows for fine-grained power profiling and control using Simplicity Studio when connected through the board’s Mini Simplicity adapter. The Mini Simplicity adapter also supports wireless network debugging, and an onboard SEGGER J-Link debugger is also equipped for general programming. 20 breakout pins, four RGB LEDs, and a CR2032 coin cell battery and external battery connector complete the feature set. The Thunderboard Sense kit (SLTB001A) is available for $36 through distributors such as DigiKey, and the free Thunderboard mobile apps can be downloaded from the Apple Store and Google Play. 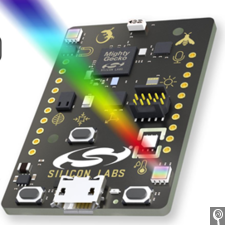 Access to source code can be found at www.github.com/siliconlabs. For more information on the Thunderboard Sense, visit www.silabs.com/thunderboardsense.